Excelsior began manufacture of motorcycles in Coventry, England in 1896 under the name of Bayliss, Thomas and Co, adding to their range of penny farthing bicycles. The first cycles had Minerva engines and were effectively mopeds. 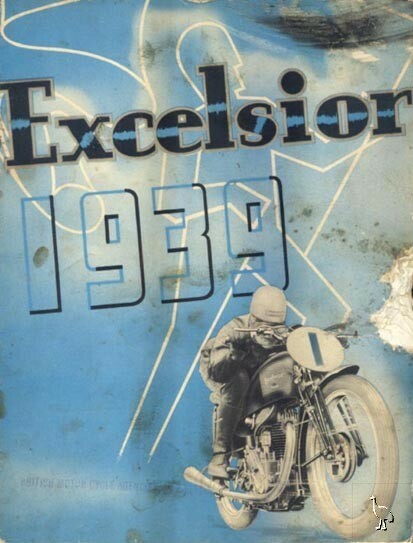 The firm adopted the name of Excelsior in 1910. 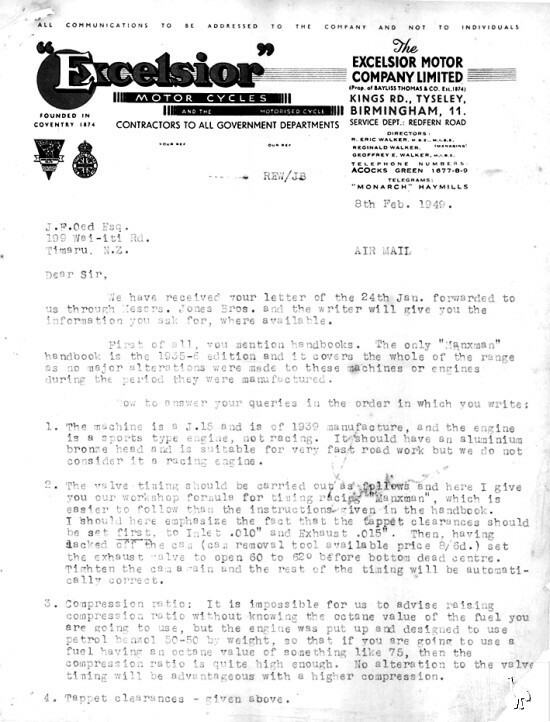 After the Great War the Walker family ran the firm, producing a range of motorcycles with engines by Blackburne, Villiers, J.A.P. and others, ranging in capacity from 98cc to 1000cc. Racing success on the Isle of Man brought popularity to the marque, and the 1935 Manxman soon made inroads on the market initially with the 250cc four-valve model which was followed by the release of 350cc and 500cc versions. They struggled on through the dark days following the Second World War for nearly two decades, finally ceasing production of motorcycles in 1965. Excelsior Talisman three-cylinder 492cc twostroke engines were fitted to Berkeley cars in the late 1950's. Offers invited for this rare historical machine. This 1939 Excelsior Manxman J15 (one of only ten built) is now for sale. 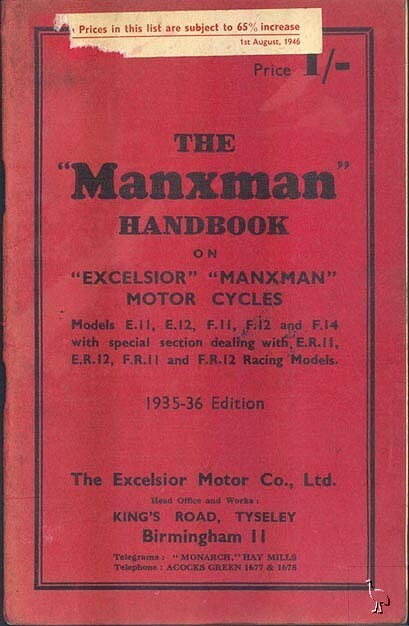 Complete with an original 1939 Excelsior Catalogue, 1935-36 Edition Manxman Handbook, an original letter from The Excelsior Motor Company Limited (dated 8 Feb. 1949) and magazine articles giving full history of this machine. Pukka racing machine of the 30s and one of only 175 racing Excelsiors Manxmen (including works bikes) ever built. This particular machine is in very authentic condition. Twin oil feeds to cambox, right hand exhaust port, alloy head, Harwell brake plates and tacho in petrol tank are among numerous components that prove its factory racing heritage. Period mods include extra stiffening bars on the Webb forks and extra cylinder head finning. Alloy rims later fitting. message: I saw The Mechanical Marvel 250, Winning the IOM-TT 1933 on Your site. My fatehr won the Swedish Grand prix on one of the four Marvels i saxtorp 1934. Would You like some Photos? 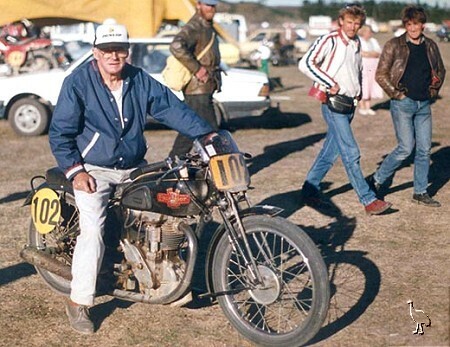 He joined the IOM-TT 25 time from 1935-53.